On the morning of December 7, 1941, Japanese bombers staged a surprise attack on U.S. military forces in Hawaii. In a devastating defeat, the United States suffered 3,435 casualties and loss of or severe damage to 188 planes, eight battleships, three light cruisers and four miscellaneous vessels. Japanese losses were less than 100 personnel, 29 planes, and five midget submarines. FDR was furious at Japan’s confidence in their “inevitable triumph” of the United States. On December 8, 1941, the United States declared war against Japan; on December 11, Germany and Italy declared war against the United States. 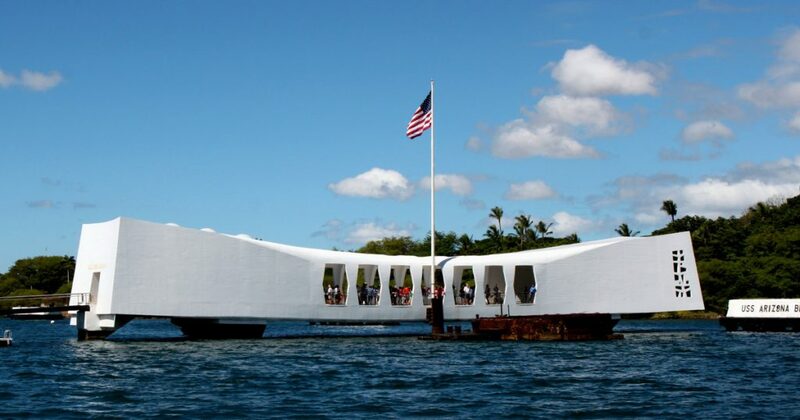 Today, the USS Arizona Memorial on the island of Oahu honors the lives lost on the day of the attack. Visitors to the memorial reach it via boats from the naval base at Pearl Harbor. Although December 7 is known as National Pearl Harbor Remembrance Day, it is not considered a federal holiday in the United States.